Last weekend Ma Langer and I went to Seattle for the annual SCAA Expo. We go to attend classes and lectures, watch competitions, look at new products, network, etc. I enjoy the people-watching. There are three main groups of coffee industry worker in attendance at the SCAA: suit-wearing corporate types (importers, equipment manufacturers, and the like; this group skews older); farmers and co-op representatives from origin countries (this year there was a huge contingent of Peruvians, and I sat next to a Robusta farmer from Uganda at the Opening Ceremonies); and, of course, your coffee hipsters. It is Coachella for coffee people. I'm going to be talking about the third group, who are also, incidentally, representatives of the Third Wave of American coffee. I looked at a street style post on Sprudge about SCAA fashion (also Pts. 2 and 3) and noticed the phrase, "In a sea of generic shirts and classic-fit slacks, these people looked lovely...." I would argue that in a sea of Clarks desert boots, Hitler Youth haircuts, cutesy-patterned button-downs and geek glasses, these people looked exactly like everybody else. I'm not just being curmudgeony for the fun of it—although it is really, really, fun. The uniform aesthetic of Third Wave baristas, roasters, and cafe owners/managers is indicative of the uniformity of their product. Cafes arealllight wood, lofty spaces, Hario V60s, twee handwritten menus, and often, unfortunately, aloof staff. 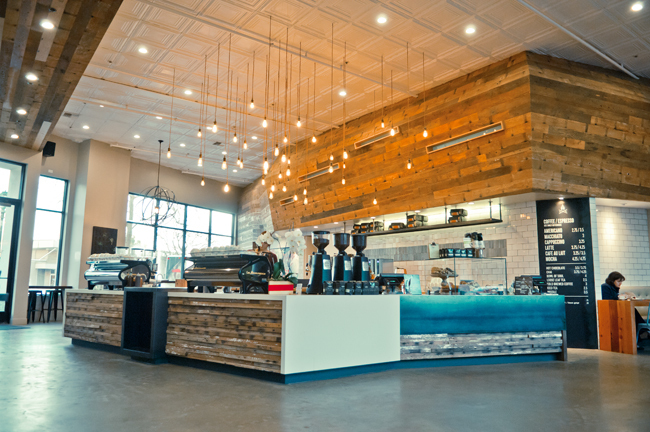 Education is vitally important to specialty coffee's mission, but there is a too-cool-for-school attitude that thrives in the high-end coffee environment. People come to our roaster all the time with horror stories about misinformed baristas telling them why they shouldn't like whatever it is they like (mostly dark-roasted coffee, but also milky drinks, blends, and flavored coffee). Third Wave coffee is reactionary. In a laudable attempt to be better than and different from Starbucks and Peet's, we have bought more expensive coffees from smaller farms, roasted them lighter, opened light, airy, minimalistic cafes, and required unprecedented engagement from our consumer. And I feel now that the Third Wave is cresting. Its orthodoxy is exclusionary and off-putting. The superficial look and feel are tiresome and generic. Much more importantly, coffee is now being frequently underroasted. I had more than one downright sour espresso. Did you know that sour, grassy, grainy tastes are considered a roast defect? They kind of are. No, it's not burnt, but it's not a particularly tasty cup, and I'm just thinking, like, the Italians figured this out a hundred years ago, that espresso is nicer when you roast it not too light and not too dark. Is there no happy medium? No room for a diversity of roasting styles? In their attempt to be different, many Third Wave roasters are producing a cup equivalent to, as one of our station instructors in a roasting class put it, "hot lemonade." What I want, see, is excellent, ethical coffee without pretense. Coffee as experiment and education, yes, but also coffee as a classic service experience, in the tradition of the Italian professional barista. I had a barista at the BGA stand, when I asked what type of Ethiopia I was drinking, tell me it was "delicious." That is not what I asked; I wanted to know where it was from, and I got a dismissive and useless one-word answer. And this is at the SCAA show, where he could safely assume that I knew what I was asking. Do your best to make a great product and let me decide if I like it, Third Wave Coffee Hipsters. If you don't assert your expertise too aggressively, and talk down to me, I bet I will. After all, we are all buying the best green coffees on the market. Living legend Erna Knutsen, the woman who came up with the concept of specialty coffee, and a couple of schlubs who begged for a photo. This has little to do with this post. I'm just very excited that I got to meet her.